This catalogue aims to illustrate an aspect of the mountain landscape of Snowdonia, which retains traces of the beliefs and rituals of the prehistoric inhabitants of the area. On many mountain summits there are prehistoric burial cairns. The significance and historical value of these ancient cairns are generally unappreciated today. Most have suffered badly from trampling or by creation of shelters and summit-marker cairns because of their location on popular walking routes. This guide aims to help the survival of these prehistoric cairns by promoting a better understanding and appreciation of them, while at the same time enhancing the experience of the mountains themselves. The area covered here is that of northern Snowdonia, within the National Park, with the addition of a few sites on nearby outlying summits, particularly on the hills of Llŷn. There are 43 summit cairns in this area that have been recognised as being prehistoric. 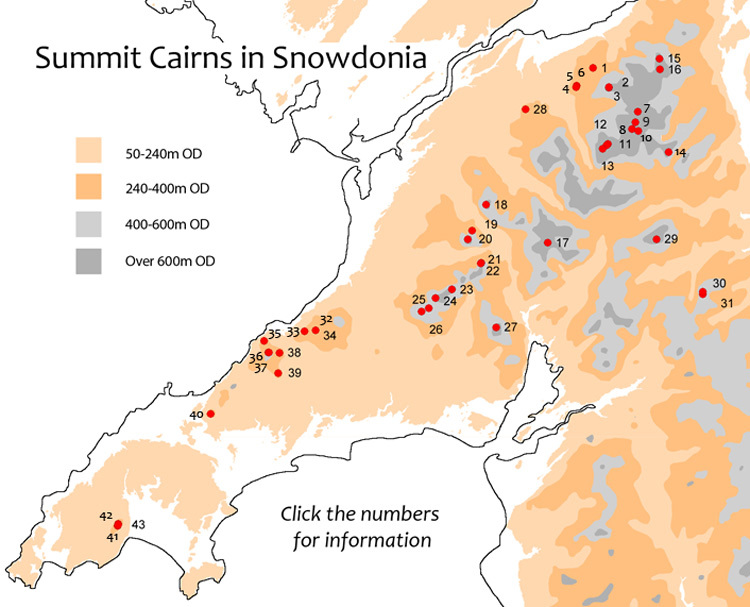 There are others on mountains to the south and east in Meirionnydd on the Arenigs, Cader Idris, Tarren Hendre, Aran Fawddwy and on lower hilltops that are not described here. The cairns are numbered for ease of reference. Each also has a Primary Record Number, PRN used in the Gwynedd Historic Environment Record. This number is given after the site name and should be referred to if there is any other enquiry or reason to report any finds or damage.